The men and women who serve in the United States Military make remarkable sacrifices for their country. But the sacrifices of their families, particularly their children, often get overlooked. Children with a parent in the military may spend much of their childhood with an absent mother or father. Even when the family is not separated, children may spend a large portion of their school years moving from military base to military base, changing schools with each new deployment. While there is no way to truly repay the service given the country by military personnel and their families, at the very least it is possible to provide financial assistance to those military children who are struggling to meet the rising costs of college tuition. Providing scholarships for the children of military service-personnel is one small way in which the people of the United States say thank you to the dedicated members of the armed forces and their families. Each state in the country has a department of higher education, and an office of veterans affairs. Most states offer some form of financial aid for the college aged children of military service-members. 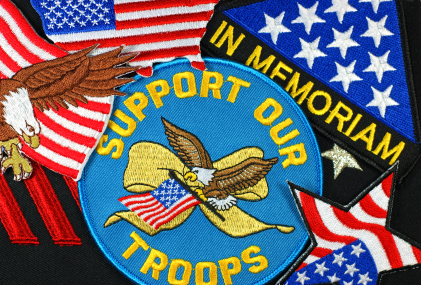 State sponsored scholarships are common for the children of active-duty, retired and deceased military personnel. Each state will offer its own programs, and each program will have its own distinctive set of requirements. Students are encouraged to contact their state’s Department of Higher Education, or Office of Veteran’s Affairs, to learn about scholarship programs for which they may be eligible. The following selection of state supported scholarships for the children of military service-members will give students an idea of the types of programs that may be available in their state. The Iowa War Orphans Scholarship provides financial assistance to the children of military personnel who were killed in combat. Applicants must have maintained an Iowa residency for at least 2 years, and must be enrolled at an approved state college, university or technical school. The annual award is $600. Students may reapply every year in which they meet eligibility requirements. Total lifetime awards can not exceed $3000. The Minnesota State War Orphans Education Program provides tuition assistance to the biological or adopted children of military servicemen and women who have been killed in combat, or who have died as a result of wounds received while in combat. Applicants must be current residents of Minnesota, and must be attending an approved state college, university or technical school. Annual awards are $750. The scholarships is non-renewable, though students may reapply every year in which they meet eligibility requirements. The Montana Department of Military Affairs supports a number of programs for the dependent children of military service personnel.Current programs include Scholarships for the Dependents of POW/MIA’s and Scholarships for the Children of Deceased Veterans. Applicants must be residents of Montana, and must be enrolled at an accredited state college or university. The Texas Hazlewood Act provides up to 150 hours of tuition assistance to the dependent children of military veterans who were killed while on active duty. Applicants must be residents of the state of Texas, and must be between the ages of 18 and 25. To be eligible, students must not be receiving any other Federal Veteran Education Benefits. Each branch of the United States Military offers scholarship, grants and tuition assistance for their enlisted personnel. Much of this financial aid also extends to the dependent children of active-duty, retired, disabled and deceased service-members. The following examples highlight the variety of programs directly supported by the armed forces themselves. The Survivors and Dependents Assistance Program is supported by the U.S. Army, and offers financial assistance to the dependent children of Army personnel who have been killed or disabled in the line of duty. The program also provides financial aid to children of personnel listed as missing in action, or declared prisoners of war. The program provides 45 hours of tuition assistance to eligible students enrolled in approved undergraduate, graduate or vocational studies. The General Henry H. Arnold Education Grant Program provides financial assistance to the college-bound children of active-duty and retired Air Force personnel. Awards are determined on the basis of need. Maximum grant allowances currently stand at $2000. The Scholarship for Air Force Enlisted Member’s Dependent Children is supported by the Air Force Sergeants Association and the Airmen Memorial Foundation. The program provides scholarships to the children of active-duty, retired and veteran Air Force personnel. Awards are determined by academic achievement, and community service. Scholarship amounts range from $500 to $3000. The NMCRS Gold Star Scholarship is supported by the Navy-Marine Corp Relief Society. The scholarship program provides financial assistance to the children of Navy and Marine personnel who were killed in the line of duty. Applicants must demonstrate the requisite level of financial need, and must have a minimum 2.0 GPA. Awards range from $500 to $2500 per academic year. The Scholarships for Military Children Program provides scholarships to the children of active-duty, retired, deceased or reservist military personnel. The program is administered through the commissaries of military bases around the world. Each commissary awards one $1500 scholarship per year. Eligible students must be under the age of 21, and must be enrolled full time at an accredited college or university. The Post 9/11 G.I. Bill & Marine Gunnery Sgt. John David Fry Scholarship is sponsored in cooperation with the Freedom Alliance. The scholarship provides educational benefits to the children of military personnel who were killed, or disabled, in the line of duty after September 10, 2001. Awards amounts vary, and can be applied at any accredited college, university or technical school. The sacrifices made by military families can only really be understood by those who have experienced them. As outsiders we can sympathize, but never totally empathize, with the challenges they face on a regular basis. Scholarships, grants and tuition assistance programs are a small way of paying tribute to the dedication and selflessness of military servicemen and women, and their families. The financial aid programs discussed here are only a sampling of the education benefits available to the dependent children of military personnel. Students can find more information through their college’s office of financial aid, and through their state’s Office of Veteran’s Affairs.